The British Orthopaedic Foot and Ankle Society Meeting was held in Newport this month. This 3 day event provided an invaluable opportunity to keep up to date, renew contacts with colleagues and discuss difficult and complex problems. 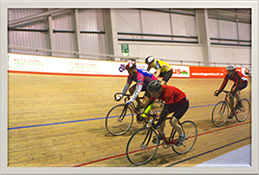 The event was held in Newport and Mr Carmichael was among 20 delegates who took the opportunity to visit the Welsh indoor cycling centre and try our hand at velodrome cycling.